Sparkling wine deserves a sparkling bottle. And that plain little vase wants some bling this Spring. Bead them! This same netting makes a great edge on scarves and other garments. 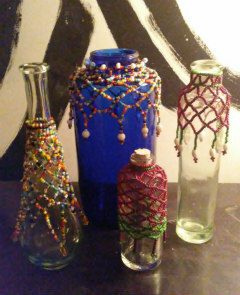 We’ll even look at beaded tassels, so popular for jewelry as well as home décor. We’ll be working mainly with seed beads though the technique is remarkably adaptable to most any bead you choose to use. STUDENTS MUST PURCHASE THEIR OWN SUPPLIES FOR CLASS.